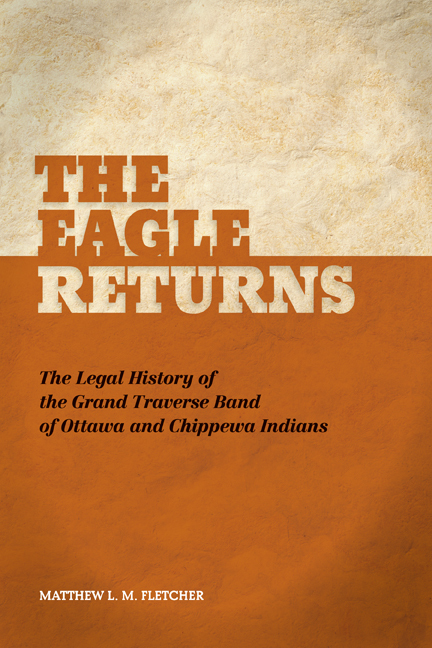 An absorbing and comprehensive survey, The Eagle Returns: The Legal History of the Grand Traverse Band of Ottawa and Chippewa Indians shows a group bound by kinship,geography, and language, struggling to reestablish their right to self-governance. Hailing from northwest Lower Michigan, the Grand Traverse Band has become a well-known national leader in advancing Indian treaty rights, gaming, and land rights, while simultaneously creating and developing a nationally honored indigenous tribal justice system. This book will serve as a valuable reference for policymakers, lawyers, and Indian people who want to explore how federal Indian law and policy drove an Anishinaabe community to the brink of legal extinction, how non-Indian economic and political interests conspired to eradicate the community’s self-sufficiency, and how Indian people fought to preserve their culture, laws, traditions, governance, and language. Matthew L.M. Fletcher is an Associate Professor in Michigan State UniversityÆs College of Law, Director of the Indigenous Law and Policy Center, and an appellate justice for several Michigan tribal courts. In 2010 Professor Fletcher was elected to the American Law Institute. "Fletcher’s articulate capture of the Grand Traverse Band’s history and current endeavors affords the reader an intimate glimpse inside the resilient strength and vision that makes the GTB what it is today – a dynamic, sovereign Tribal Nation with a strong regional economic presence and commitment to further enhance the lives of future generations. Kchi Megwetch [with great thanks] to Professor Fletcher, a proud GTB citizen." "In this important work, Matthew Fletcher provides a thorough and sobering legal history of the Grand Traverse Band, a Michigan Indian community “administratively terminated” by the Department of Interior in the 1870s and reorganized after generations of political efforts in the 1980s. As Fletcher highlights, the nebulous and changing realm of jurisprudence confronting this community of Ottawa and Chippewa Indians confirms the truism that whenever Congress sneezes, Native peoples end up in the hospital. In the detailed rendering of this tribal history moreover one also sees the unrivaled determination of Indian community members seeking justice for lost lands and rights. A wonderful contribution."